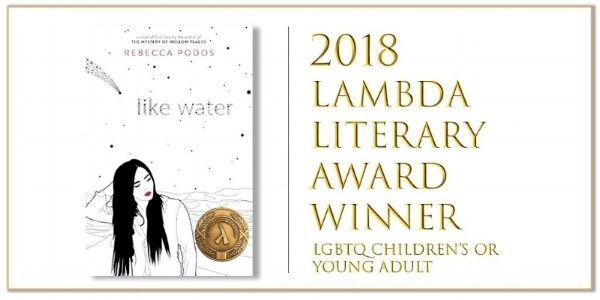 Thanks to Lambda for choosing LIKE WATER as the 2018 Lambda Literary Award Winner in LGBTQ Children's or Young Adult! I got to geek out over Ellie Linton, my original literary heroine, in this post for Pop! Goes the Reader's annual Her Story series. THE MYSTERY OF HOLLOW PLACES has been nominated for a 2016 Agatha Award honoring traditional mysteries; woohoo! Thanks Barnes & Noble for naming THE MYSTERY OF HOLLOW PLACES among the Best YA of 2016! THE MYSTERY OF HOLLOW PLACES has made Booklist's wonderful 2016 "Top First Novels for Youth." It's official! My second book, LIKE WATER, drops in fall '17! THE MYSTERY OF HOLLOW PLACES was picked as one of the Best YA Books of 2016 so far, alongside awesome Sweet Sixteens like Jeff Zentner, Heidi Heilig, Roshani Chokshi, Parker Peevyhouse, Kerry Kletter, Meredith Russo and more! Book Riot's 3 on YA list Female-Driven Thrillers includes THE MYSTERY OF HOLLOW PLACES as one of several books that "appeal to readers who want fast-paced, action-driven stories that put girls front and center." In quite possibly the coolest list of all time, "What to Read Next Based on Your Favorite Clone in Orphan Black, The Mystery of Hollow Places is declared a match for Sarah Manning. Thanks, BNTeen! The line-up for the 2016 Boston Teen Author Festival has been announced, and I finally get to announce that I'll be participating! I am blown away by the list this year, which includes some of my writing heroes, and some amazing fellow '16 debuts. THE MYSTERY OF HOLLOW PLACES has been included on Booklist's list of Top Ten Crime Fiction For Youth: 2016! Huge thanks to the Chicago Tribune for including THE MYSTERY OF HOLLOW PLACES in its fabulous Young Adult Roundup! Christine Heppermann says: "The most persistent heartbeat in 'The Mystery of Hollow Places,' the refrain that holds everything together, is the reality of mental illness, how it can drive people to pull away from those they care about the most. With each step, Imogene draws closer to realizing that finding her parents probably won't take away the hurt of losing them in the first place...But at least she can fill her own hollow place with acceptance and truth." This week I had the opportunity to write a post for Nerdy Book Club, the fantastic online space for lovers of Children's and YA books. I'm hugely honored to have my essay "It Will All Be Right by the End" up in a community that I so love and admire. THE MYSTERY OF HOLLOW PLACES has received it's third starred review from The Bulletin of the Center for Children's Books! THE MYSTERY OF HOLLOW PLACES gets an absolutely love review from BookPage! "Narrated in Imogene’s sardonic and observant first-person point of view, THE MYSTERY OF HOLLOW PLACES explores themes of isolation, identity and familial ties. It’s not exactly a thriller, but it’s a page-turner nonetheless, with writing that’s crisp and efficient and characterization that’s strong and dynamic. This extraordinary debut novel from Rebecca Podos is an easy contender for a Morris or Edgar Award." Lovely news on a Wednesday: THE MYSTERY OF HOLLOW PLACES is a February Staff Pick at one of my very favorite Boston-area bookstores, Porter Square Books. "In THE MYSTERY OF HOLLOW PLACES, Imogene Scott’s mystery novelist father goes missing, and it’s up to Imogene to find him using the skills she’s gleaned from a lifetime of reading his books. But what kind of things can you learn from fiction anyway?" Check out my post on Epic Reads to discover 8 Things I Learned From Books! Here's a list I can get behind! Take a look at B&N Teen's recommendations (including THE MYSTERY OF HOLLOW PLACES) for "6 Wintertime YA Novels To Read Under A Giant Snuggly Blanket."